The apartment is on the second floor of a building currently undergoing renovation, and has a surface area of ​​107.90 m2. 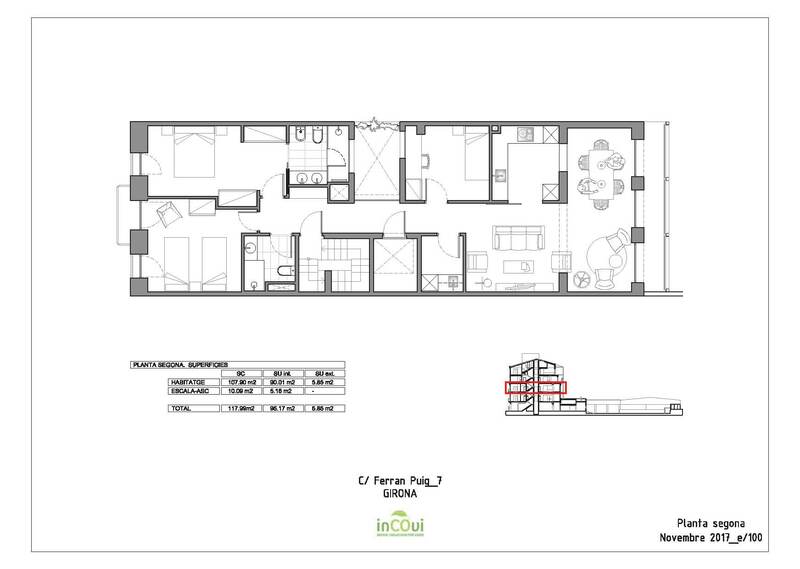 The useful area is 90.01 m2, distributed in living room, kitchen, dining room with a gallery with access to the terrace, two double bedrooms -one of them with bathroom- one single room, a second bathroom and a laundry room. The corridor and other rooms ventilate to a courtyard with a plant wall, and the dining room has access to the rear terrace, of 5.85 m2 oriented southwest. The elevator of the building is of low consumption and arrives directly inside the corridor of the apartment. The rehabilitation of this building follows the INCOVI-Eco8 model, which complies with the most demanding standards in terms of sustainability (process and construction systems, good insulation, efficient installations...), so that high energy efficiency is achieved and a high level of comfort. One of the differential features is the possibility of personalizing the home. The finishes are of high quality and special importance is given to the insulation and to the installation systems, which are those that provide comfort, such as the solar protection of the rear facade by means of stackable and adjustable Venetian blinds. Heating is by gas through thermal floor and there is pre-installation for air conditioning. The hot water and part of the heating are supported by renewable energy through flat solar collectors. The building is located in the center of the city, near the Devesa and the train station, in a recently renovated area with bike lane that crosses the city. The apartment is on the second floor of a building currently undergoing renovation. The corridor and other rooms ventilate to a courtyard with a plant wall, and the dining room has access to the rear terrace, of 5,85 m2 and oriented southwest. The rehabilitation of this building follows the INCOVI-Eco8 model, which complies with the most demanding standards in terms of sustainability (process and construction systems, good insulation, efficient installations...), so that high energy efficiency is achieved and a high level of comfort. Bus: L2, L3, L4, L5, L7: 1 min walking distance. Bus/train/AVE Station: 6 min walking distance.